A new report published today by SPERI finds that the impact of the pension ‘triple lock’ is modest and should be maintained. 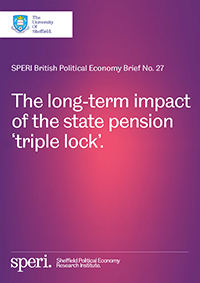 In this new Brief, Craig Berry explores the merit of the criticism the triple lock attracts by considering the policy’s long-term impact on state pension outcomes; in short, the triple lock is assessed as a pensions policy, not simply a pensioner policy. The analysis places the triple lock within the context of the wider operation of the UK state pension system for different age groups, after comparing the UK state pension system with those of other developed countries. The analysis finds that concerns about the state pension triple lock being too expensive, or unfair on younger generations, are misplaced. The Brief argues that the triple lock helps to nudge the value of the state pension towards the OECD average – albeit arguably far too slowly – and considers, finally, other policy options that might mean that the same goal can be achieved in a more fiscally sustainable manner. “Young people are the main beneficiaries of the triple lock. There are several options the government could pursue to enhance the value of the state pensions today’s young people will become entitled to when they retire – but few have the elegant simplicity of the triple lock. The full report can be downloaded here. Through its series of British Political Economy Briefs, SPERI hopes to draw upon the expertise of its academic researchers to influence the debate in the UK on sustainable economic recovery.